I know, I know. Where on earth have I been? Mainly swearing at the internet (or lack of it) we seem to be back up and running (hope I haven't spoken too soon) although at a much slower speed. Yay to technology (again). Perhaps it just doesn't like me?! Lots of things to show and tell to catch up. I thought perhaps it would be best to break them down into bitesize chunks. It'll stop me gettting confused and wandering off to a completely different subject. Trust me on this one or just ask Mr Bogert. So first things first. Well done Bessy Bear! 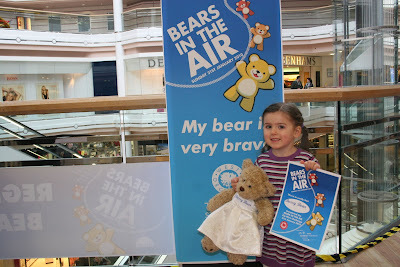 She did go through with the zip wire leap if faith across the shopping centre roof and we were all very proud of her. £45 raised by Alexandra and Bessy Bear will be handed in shortly ready to go to the NSPCC. We did however forget to take the camera, so the only picture we have is the one taken by the shopping centre staff that we was emailed to me this morning. We had a little hiccup after the daring event. The small person insisted that Bessy bear needed the toilet an couldn't wait. I thought this was code for Alexandra really needs the toilet and can't wait, so told Mr Bogert we'd see him on the car park level above in a minute. I found out that Bessy bear needs the toilet was not code for anything as I found myself having to hold Bessy bear above a toilet in pretend wee mode. The things parents do. Anyway, we got to the escalator to take us up one level to where Mr Bogert was waiting for us, I had her hand tightly and I said ready, then I got on and the small person didn't. I tired to step backwards to get back to her, but had heels on and couldn't move fast enough, so I let go of her hand because I was going to pull her over. I then turned fully around to try to make my way back down the steps, and she decided to get on on her own, but out her hands on the glass/plastic siding that doesn't move and it pulled her over onto her bottom, but because the steps were still moving she couldn't get up and rolled, and to my horror she just kept rolling on the bottom steps. She started to panic calling out for me, I was completely panicking trying to get back down the steps and then a member of staff at the shopping centre ran over and hit the emergency stop. Never before have I been so scared! My hands were shaking (and I even had a little cry when we got back to the car!) She was unhurt, but I just kept thinking what if her clothes or hair got caught in the steps? It was a horrifying moment that seemed to take ages, but in reality was just a few seconds. Both the small person and I did recover from the escalator incident and so the week carried on. 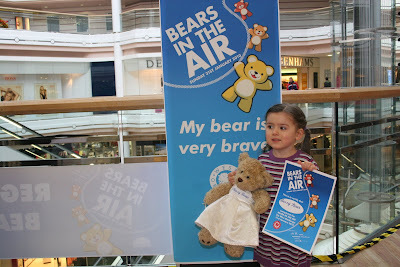 She took Bessy Bear and the certificate into pre-school last Thursday to show everyone and tell them all about it (bears in the air, not the other). She did such a good job she got a special gold star sticker award in her record book. She's extremely pleased with herself. We also had confirmation of Alexandra's school place ready for September. She's got a place at our first choice school. (Yes Heather, it's St Nicks). Not sure what I'll be thinking in September when my small person leaves me to start school life. I'm not going to know what to do with myself! We have also been drawing up a list of wonderful things to purchase for toddler group. I asked the mum's, childminders and nan's who bring children to toddlers, and I also asked the volunteers, especially Sheila, who used to run the group for many years. We chose things based on what needs replacing because it is old broken or unsafe, and also things that we don't have to offer the children. There were certain areas we were definitely lacking in (such as baby floor activity mats and role play items). Now I just need to type it up and see which is the most urgently required, then work towards the rest. That I do feel optimistic about. So that's catch up installment number one. Come back for part 2 later today. There will be something I was ver excited about in that post!